It's shortly after nine on a crisp April morning, and you've just eased yourself into the old leather easy chair way back in the secluded northeast corner of the Salinger Aviation hangar. Although it's still early, it has been a busy morning and you're ready to take a break. You've barely opened the latest issue of Aviation Week, however, when you overhear your receptionist on the phone in the outer office. So much for the break! It's another rush assignment. Your first inclination is to silently grumble, but you catch yourself; instead, you thank your lucky stars business has been so brisk. You're co-owner and operator of Salinger Aviation, which provides a variety of general-aviation services at Danielson Airport in Connecticut. Your receptionist is now booking three passengers for immediate air-taxi service into Boston-Logan International, where they wish to connect with a scheduled commercial flight. Pulling the clipboard and chart from your flight case, you call for a weather briefing, rough out a flight log for this familiar hop, and call Flight Service to file your IFR flight plan. There's no FAA facility on the field at Danielson, so you'll depart VFR and obtain your clearance from Bradley Approach Control once you have enough altitude for radio contact. The en-route weather looks good, with no significant winds and some scattered cumulus at 4000. There may be some turbulence below 4000 from vertical currents causing clouds to form at that altitude, but the flight is short so you request 3000. You can always ask for a higher altitude later if there's enough turbulence to bother your passengers. You note that the frontal movement warrants some caution. The front is weak with no significant weather, and terminal forecasts are okay, but things can always change. The cloud cover at Boston has increased from scattered to thin broken, and that, along with the falling barometer, suggests an early arrival of the front in the Boston area. IFR conditions and/or thunderstorms could develop locally, and the surface winds may be gusty after frontal passage. It's not likely Logan will fall below minimums, but, should you need an alternate airport, Martha's Vineyard seems an obvious choice. Since the front is moving in from the northwest, if conditions at Boston deteriorate you'll be able to reach the Vineyard well before the front arrives in the Cape Cod area. 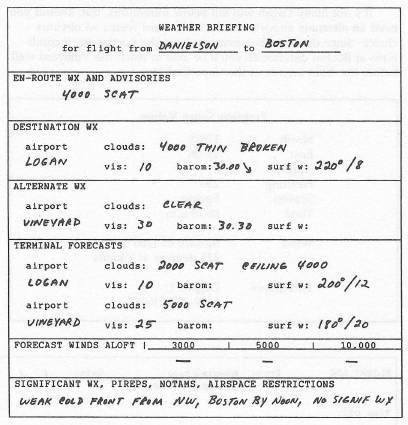 You also note that the surface winds predicted for Logan suggest Runway 22 Left or 22 Right as the most likely runway for arrival. 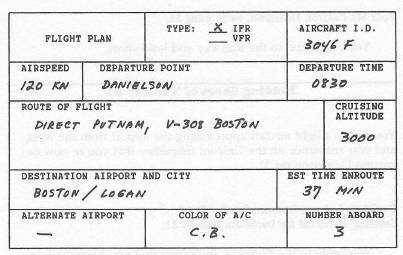 The usual route is direct to the Putnam VOR and then Victor Airway 308 to Boston. V-308 follows Putnam R-057 outbound to Bosox Intersection before bending at Bosox to pick up Boston R-086, which it follows inbound to the station. A yellow cab has dropped off your passengers; they're now aboard and strapped in, and the engine is running. Danielson Unicom, Cessna Three Zero Four Six Foxtrot at Salinger, which way please? 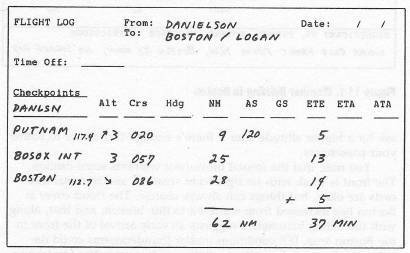 Four Six Foxtrot, Danielson, we're using 31. You reply; taxi to the Runway and hold short. You notice a light aircraft approaching the airport from the west, and you announce on the Unicom frequency that you're now departing Danielson on 31. Entering downwind for Danielson Runway 31. You reply to the Bonanza, indicating that you have them in sight. Taxi into position and depart. Squawk two zero three zero. You read back to confirm. Ah, Four Six Fox what's your ETA for Bosox please? Four Six Foxtrot Boston Approach on one two zero point six bye. Expect visual approach to Boston Runway 22 Right. On one one niner point one so long. Heading zero eight six degrees. Four Six Foxtrot descend and maintain one thousand. Heading zero four zero degrees. Contact Boston Ground on one twenty-one point niner good day. An American Airlines 707 is crossing from left to right on the taxi strip ahead. Ah, Four Six Foxtrot Boston Ground where to? You state your destination as Butler Aviation. That's straight ahead there to the Butler ramp. Wind direction. Keep in mind that the reported wind direction is the direction from which (not toward which) the wind is blowing. For example, the expression “220 degrees at 7” means the wind is coming from 220 degrees at 7 knots. Thus, if your heading is 220 degrees and you have a wind of “220 degrees at 7,” you have a direct headwind. True and magnetic north. The headings you use for navigation are magnetic headings, which means they refer to magnetic north, as indicated by the compass. When control tower operators give surface wind directions to landing and departing pilots, they also refer to magnetic north to minimize the chance of confusion during takeoffs and landings. However, you might want to be aware that the wind directions given in aviation weather reports refer to true north, not magnetic north. The difference between true and magnetic north is called compass variation and is the result of the earth's nonuniform magnetism. The difference can be as much as 10 or 15 degrees, depending on your location. For most simulator purposes, however, you can ignore this distinction between true and magnetic north. Departure crosswind. The surface wind on this flight is from 220 degrees, so regardless of which way you take off at Danielson (Runway 13 or Runway 31), you have a crosswind on departure. If you depart on Runway 31, for example, as soon as you lift	off you notice the aircraft drifting off to the right of the runway because of the crosswind from the left. (Again, visualize the runway and wind directions from above.) Thus, if you have departure instructions to “maintain runway heading,” you have to start crabbing the airplane to the left immediately after liftoff to maintain a straight course. given speed. A wind described as “220 degrees at 7,” for example, means the entire air mass is moving from 220 degrees at 7 knots. However, the Pitot-tube mechanism that operates the airspeed indicator on your instrument panel measures the speed of the aircraft through the particular mass of air in which it's flying; it doesn't measure the speed of the aircraft over the ground. Therefore, if there's a wind—if the air mass in which you're flying is itself moving over the ground—then the airspeed and ground speed will differ. In practice, an airplane's indicated airspeed and actual ground speed are very rarely the same. For example, suppose the indicated airspeed is 100 knots and you have a direct tail wind of 7 knots. That is, you're moving through the air mass at 100 knots while the air mass itself is moving in the same direction at 7 knots. Thus, your actual speed over the ground is 107 knots rather than the indicated airspeed of 100. Similarly, with a 7-knot headwind, your ground speed would be 93 knots instead of 100. As a result, if you have a significant headwind or tailwind, you have to take into account the effects of the wind on your ground speed when you estimate your time en route between checkpoints. The winds aloft are not significant on this flight, so airspeed and ground speed are the same on each leg of this trip, but such wind considerations become important later on. Wind directions and runway selection. Since a headwind results in a ground speed lower than the airspeed, aircraft ordinarily take off and land into the wind to lower the ground speeds. The runway in use at a given airport, therefore, is usually the one that allows landing and takeoff most directly into the wind. At uncontrolled fields, you should select your runway to take advantage of any existing wind. Wind effects in a traffic pattern. Because the final approach is usually into the wind, the downwind leg of a conventional traffic pattern usually involves a tailwind, as the name of the leg implies. As a result, your actual ground speed on a downwind leg is usually greater than the airspeed indicated on the panel, and you might find yourself completing that leg more quickly than expected. However, the surface wind effect noticed most occurs as you turn from the downwind leg to the base leg, and then from base onto final. downwind leg. As you begin the 90-degree left turn onto the base leg, the tailwind gradually becomes a crosswind from your left. Since the tailwind effect has now diminished, your actual ground speed decreases as you turn, and the increasing crosswind effect cause you to drift rightward in the direction of the wind. As you turn from the base leg onto final, the crosswind gradually becomes a headwind, further reducing your speed over the ground. Unless you allow for the changing effect of the wind during the turns, the aircraft tends to trace out an asymmetrical arc over the ground. As you turn onto your final approach, you may find yourself much farther downwind from the runway threshold than you intended. To make symmetrical turns from the downwind leg onto the base leg, and from base onto final, you have to bank more steeply than normal when you begin the initial turn—while you still have a tailwind and higher ground speed. Gradually make the bank more shallow as you come around into the crosswind on the base leg and into the headwind on final approach. Crosswind landings. To land in a crosswind, simply crab the airplane slightly into the wind on the final approach so you maintain a course directly to the runway. When you're just about to touch down, ignore the wind: Turn back slightly to line up the airplane with the runway and land normally. Bridgeport brush-up exercise. To get the feel of flying a pattern in wind, enter the same setup parameters used for Sikorsky in the initial check rides, and set a surface wind up to 1200 feet from 060 degrees at 10 knots. This is a direct headwind for takeoffs and landings on Runway 6. Take off on Runway 6 and fly the pattern a few times, landing on 6 each time around. Then try a few more landings, first with the wind at 5 knots and then with it at 20.